Similar in length as the Isuzu D-Max V-Cross, at around 5-metres long, the Tarok Concept gets an innovative ‘variable loading area’. The variable loading area includes a foldable rear panel behind the rear seats, flat folding seats and an extendable bed. Other updates include interior design borrowed from new-gen VWs like the all-new Polo and a new pure-ethanol compatible engine. 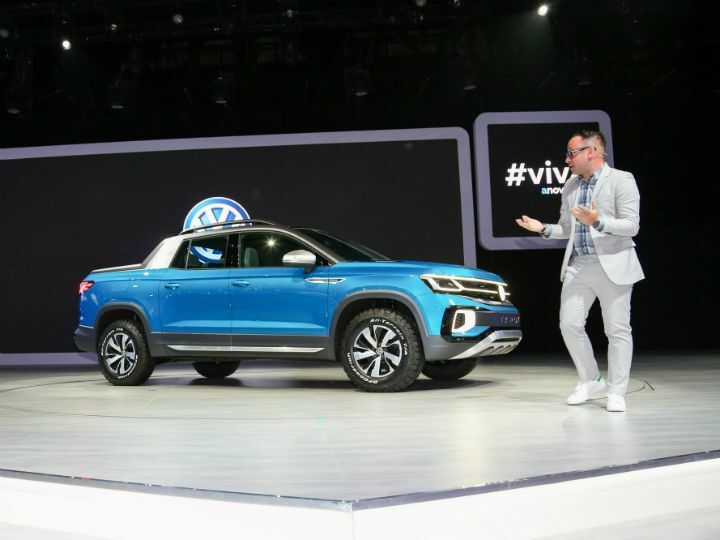 Volkswagen has unveiled a new pick-up truck concept at the ongoing Sao Paulo Motor Show 2018, touted as the most advanced of its kind in the 5-metre long pick-up truck segment. Primarily designed for the Brazilian market, where pick-up trucks are quite popular, the Tarok Concept pick-up previews innovations which could make double cab pick-ups more versatile than ever. The innovation here comes in the form of a variable loading area to improve utility. A folding panel below the rear windshield combined with flat folding rear seats results in an extended loading area for long-and-low luggage, making it more versatile than traditional dual-cab pick-ups. The Tarok Concept also previews a new petrol/ethanol engine which can run on 100 per cent ethanol, in accordance with Brazilian TotalFlex fuel norms. The 1.4-litre, 4-cylinder, TSI motor develops 150PS of maximum power and is paired with a 6-speed automatic gearbox along with a permanent '4Motion' AWD system. When launched, the Volkswagen Tarok will also be offered with 2.0-litre, 4-cylinder, turbo-diesel motor also developing 150PS of maximum power. Volkswagen says the Tarok will be a global model, which makes us believe it may be launched in India too. Would you like to see the Tarok make its way to India? Let us know in the comments section below.